We’ve talked about netting stitches on some of the articles before. 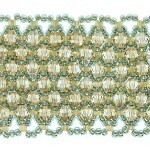 We’ve featured a video tutorial by Jewelry Supply on how to do basic netting stitch. We also created diagrams for Horizontal Netting Stitch and Vertical Netting Stitch, hoping that this help, to clearly understand how the stitch works for netting technique. 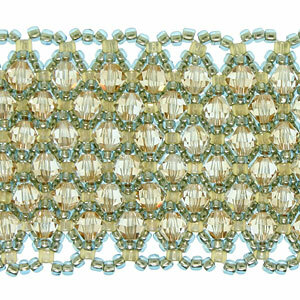 Now, you know the technique…practice makes perfect and beadweaving is a continuous learning experience so here are some netting tutorials to give you ideas on what possible designs you can create with netting stitch. I am absolutely crazy for geometric forms in jewelry, and according to the Pinterest boards, so is everybody else. Geometric jewelry is one hot trend that will carry into fall, and it’s easy to incorporate into your collection. A perfectly patterned piece can bring order to an otherwise disorganized outfit. On days I’m feeling a little shabby, putting on a sharp-angled architectural piece helps me feel pulled-together. 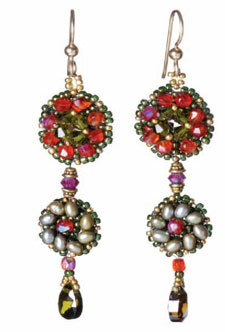 So, I decided to put my own flare on two designs from the August/September issue of Beadwork. Download your copy of Beading Daily’s Free Guide to Beadweaving: Patterns and Instructions to Learn How to Bead Weave today. 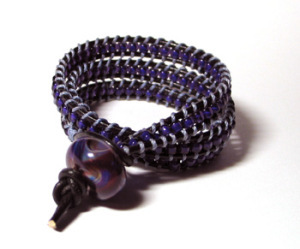 Master the Art of Bead-weaving With Our New Free eBook. There’s no doubt that if you’re reading this, you’re someone who knows that there’s a special kind of magic in bead-weaving. I named this the “Meadow Stream Bracelet“. We used to own some property that bordered a meadow with a view toward Mt. Rainier. There was a little stream that ran through the meadow. I loved to sit by the stream, in the spring, among the wildflowers, looking out toward majestic Mt. Rainier in the distance. The turquoise in this bracelet reminded me of that stream and the daisy button clasp reminded me of the wildflowers in the meadow. The techniques I employ in jewelry making often cycle – I started with beadweaving and often return to it, but I’ve also explored loomwork, kumihimo (Japanese braiding), wire wrapping, knotting & macrame, and of course your basic bead stringing. All of these techniques can make gorgeous jewelry depending on the thought that goes into the design and the proficiency of the execution of the design. Practice and planning are key to any successful piece. Learn how to weave Hello Kitty. I have new version; easy to follow from start to finish. Part 1 & 2 www.youtube.com www.youtube.com Free video tutorials beads animals.